Join the Blackbrook Farm Crew!! We encourage folks to apply who have a desire to farm on their own in the future. For the 2019 season, we are looking for 3 full time positions and possible 1-2 part time positions. We are looking for applicants who are self-motivated, good communicators and have an eye for efficiency and quality, which are not mutually exclusive. Your responsibilities will be in all areas of the farm and will include but are not limited to: greenhouse propagation, transplanting vegetables, cultivating, harvesting and packing vegetables, tending to the animals, tractor work and more. We need people who are able to take a leadership role, can work alone or in a group, are interested in gaining knowledge and learning how to work more efficiently and get work done! We do have high expectations of our employees, and in return you are rewarded with a decent wage, all the food you could want, good community and a degrees worth of education on how to farm organically. This is a high paced production farm, so you learn by doing. If you are interested you can learn how to do a multitude of tasks on the tractor including cultivating, spreading, bed preparation and more. All employees will learn how to propagate plants, transplant, weed, harvest and pack vegetables, how to irrigate using drip and overhead, how to grow in high tunnels, and how to tend to pastured animals. The Pack-Shed Leader needs to have at least one year of vegetable production experience. They will lead the other employees in post-harvest handling, washing and packing the vegetables. They will show and train others on quality standards, washing techniques and packing standards. They will keep an inventory of pack shed supplies, keep the pack-shed clean and keep us up to date on produce inventory, quality issues and things to order. They will also take part in some of the daily planting, harvesting, weeding, etc with the rest of the crew. The Harvest/Farm Crew Leader needs to have at least one year of vegetable production experience. They will lead the Farm Crew in planting, harvesting and weeding in conjunction with myself. This person will be in charge of quality control in the field (spacing, bunch size, dirtiness, uniformity, etc). This person will be in charge of making sure the crew has what they need in the field in order to harvest, plant or weed(harvest tools, knives, bins, scissors, water for hydration, hoes, etc). They will also work directly with me on creating harvest lists, planting, keeping track of planting schedules, weeding scheduling, goals for harvesting, helping with efficiencies, helping train crew members on harvesting and efficiency where needed. They will work with the crew on all other matters of the farm including greenhouse work, animals rotation, weeding, irrigating/etc..
Farm Crew Employee will assist the leaders and me in greenhouse work, planting ,harvesting, packing, weeding an animal chores. Skills Desired: Applicants for the farm crew positions do not need to have experience, although it is preferred and desired. We train new employees every year and are interested in employees who have a desire to work here for more than one year with added responsibility and pay. The primary skills required will be a strong work ethic and common sense. Skills and experience needed will be someone who wants to learn by doing, is motivated and have enthusiasm and energy, has an ability to easily lift 40lbs and is physically able bodied, manual labor skills will help but is not required, a strong mental state and ability to take constructive and positive criticism and an ability to work as a team. Compensation: We work Monday-Friday 8-5. Rarely we will work over time. Sometimes the leaders will meet with me before or after work. Weekend hours are not required unless you sign up to do animal chores. 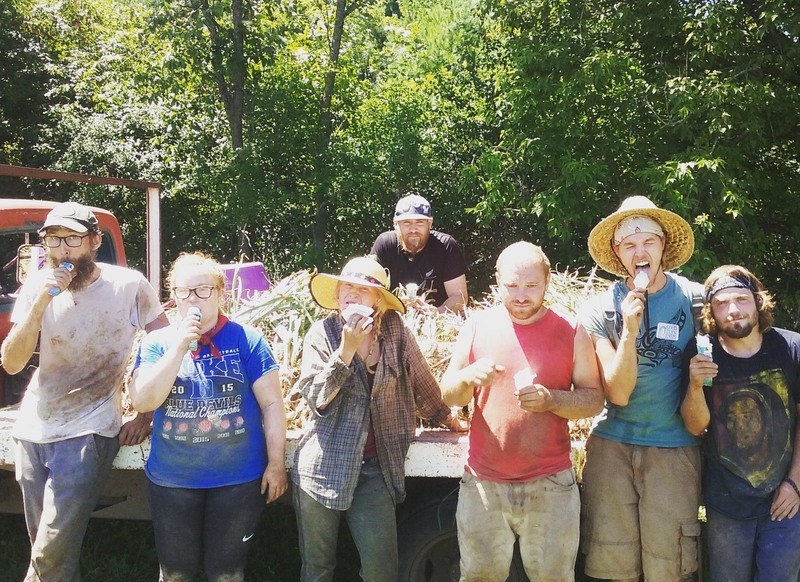 Starting pay is $10/hour for the Farm Crew positions and will be higher if you have a year or more of organic farming experience or other production farming experience. The Packshed and Harvest Crew Leaders will be paid based on experience and will start at 12/hr. You also are fed Monday-Friday and can use veggies, meats and eggs from the farm. We take out room and board from your paycheck. If you do not live on the farm, your mid-day meal is taken out of your paycheck. Employees are paid at the beginning of the month for the month prior. Meals: We eat well, using our vegetables, meats and eggs from the farm as well as other local foods. We consider food and meal time to be one of the most important activities and benefits of working on our farm. We share in a mid-day meal together. We value the quality of our meals, so when we do not personally prepare the meals, we have our employees prepare them on paid time. You can purchase food items you want for yourself (within reason) or for communal meals and be reimbursed monthly if you are living in the farm. Housing: You will be provided with a reasonably sized private bedroom in our intern house or in a camper. Internet is provided. Please bring boots, mud boots, rain gear, appropriate clothing for all types of weather and sheets and pillows for your bed. You do not need to bring any furniture.